When it comes to the best and worst picnic food, potato salad can be either one, depending on how you make it. This one is tasty, and low in cholesterol and saturated fat. When it comes to the best and worst picnic food, potato salad can be either one, depending on how you make it. Even better, it's only 154 calories per 3/4 cup serving. 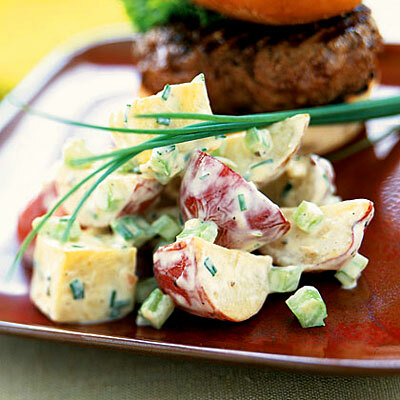 Just combine those ingredients with red-skinned potatoes and sweet potatoes (a great source of vitamin A), along with shallots, fresh chives, and chopped celery for a tasty healthy dish with a bit of crunch.